Our team here at Mobility One are asked many questions about the used wheelchair accessible cars we carefully choose, prepare and provide for our customers. Many are about the modifications made. In this blog, we thought we’d talk about just one example of our many wheelchair accessible vehicles. 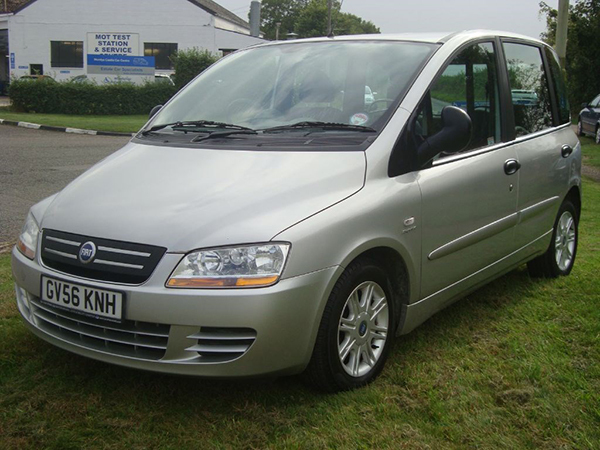 At the time of writing we have a 2006 Fiat Multipla JTD Eleganza Wheelchair Up Front Model currently available, and with less than 15,000 miles on the clock. The wheelchair accessibility redesign was carried out by Brotherwood Automobility. For three decades, they’ve quite simply been the go-to people in this highly-specialised field. Rod Brotherwood, ex of Westland Helicopters, started by converting a car for his friend and neighbour who had been paralysed in a motorbike accident. John, his neighbour, added one key request – not to make the end result look outwardly like a vehicle only for the disabled. This has been a company watchword over the succeeding years. You can see this is certainly true with our Fiat. It is an upfront passenger modification, meaning that the wheelchair user gains access from the rear by using a short ramp and can then wheel right up next to the driver. There is then a four-point securing system. This single-owner Eleganza has a stainless steel cage behind the driver for a pet, shopping or storage. If that’s not for you, the original seat is available and can be quickly restored. There are a whole range of terrific features as well, including: stacking CD, reverse parking sensors, air-con, multiple airbags, central locking, alloy wheels and much more. Of course, there’s a complete service history, it will be provided with a new MOT and full service, and a comprehensive parts and labour warranty. We also take any other vehicle as part-exchange for your purchase of one of our used mobility vehicles. This is just one superb example of the terrific range of used mobility vehicles and wheelchair accessible cars we are currently able to supply. To organise an obligation-free test drive of any of them, please call Nick here at Mobility One, on , or outside hours on 07831 140900.